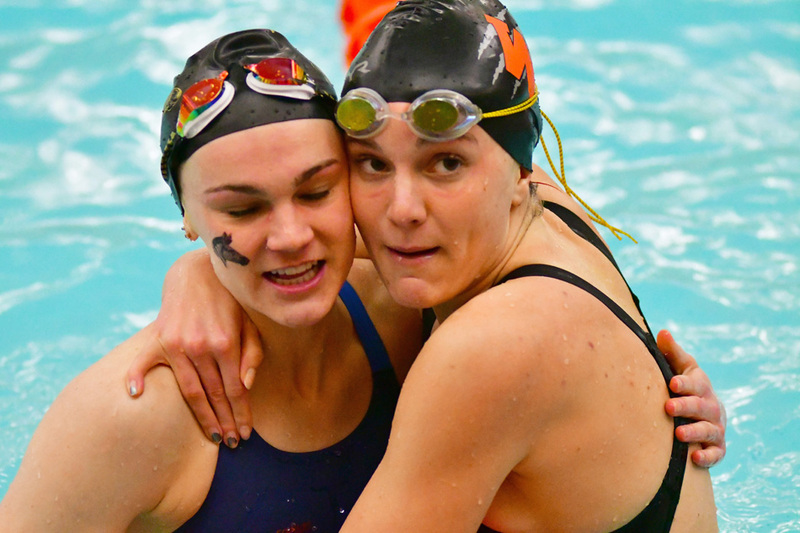 WARSAW – Most swimmers would have been a mess on the deck after a sectional loss. All the work in the offseason, all the two-a-days, the hundreds of miles prepping for the conference and sectional tourneys. Warsaw Community High School senior Delaney Wihebrink may have shed a tear or two after last year’s sectional. But it wasn’t simply because she lost. It was because she was learning about winning. Quite a statement from a swimmer who has been accustomed to winning. After winning both the 200 individual medley and the backstroke as a sophomore, Wihebrink found herself in the IM and breaststroke finals as a junior. In both cases, Wihebrink was paired against McCarter. And in both cases, McCarter set school records to knock off Wihebrink. For the Warsaw junior, however, she also was in record-setting mode. Her time of 1:06.19 in the breaststroke was the finest in Warsaw program history, and scored Wihebrink an at-large appearance at the IHSAA State Finals. The two relays Wihebrink also helped motor along set records as well, the medley relay posting a 1:50.91 and the 200 free relay a 1:40.34. Those three school records meant as much, possibly more, than the state appearances. Wihebrink noted she enters her senior season without a definite set of swim assignments, rather hoping to iron that out early and fill in where coach Tony DeBrota needs her skill sets. The Grand Valley State University commit said she likely will also fill in as needed at the next level, so her senior season isn’t going to be based on competing for attention. Something that also has helped ease her mind. Wihebrink headlines what will be an experienced core of swimmers for the Tigers. Olivia Herman, Gracie Scholl and Gracie Willig are among those that should impact immediately, and DeBrota said he could point to another dozen or so he’s excited to see get going. “Great turnout on preseason,” started DeBrota. “A lot of kids got a good head start, so we can really hit the ground running early on for the regular season. Numbers on swim/dive are consistent with last year, dang near the same I believe. We have so many I see making a positive impact both with performance and attitude. Warsaw begins its competition season Saturday on the road at Wawasee.